Saving Private Ryan is an important movie for many reasons. It was the first film to give an honest and accurate portrayal of not only D-Day, but of war in general. It put it all out there and gave us a gritty and realistic look at what life was like for those soldiers that gave their all for our freedom all those years ago. I just felt the need to say that because Saving Private Ryan is not my favorite movie of 1998. It probably should be. It is certainly the most well-made, beautifully shot, and brilliantly acted film that came out that year. It is without a doubt the most culturally significant film that came out in the latter part of that decade. And if I had to make a list of my favorite war movies it would definitely be on there. Come to think of it…I think we did that on the podcast and it was. But it’s not my favorite. My favorite, while also being one that I consider important, is not quite as impactful as that. My favorite film of 1998 is The Truman Show starring Jim Carrey, Laura Linney, and Ed Harris. I was a huge Jim Carrey fan when I was a teenager. Ace Ventura: Pet Detective, Dumb and Dumber, and The Mask were a trifecta of films for me. I considered them to be comedy classics and as far as I was concerned they belonged in a hall of fame somewhere between Abbott and Costello and Charlie Chaplin. I stayed a fan of his through my young adult years as he attempted to make some darker themed films like Cable Guy. And then it was announced that he’d be making this movie with director Peter Weir. This was in my film infancy so I didn’t really know who that was at the time. All that I knew was that Jim Carrey was going to be in a real movie, one that people weren’t going to look down on for being slapstick humor. When I saw it I thought I was watching one of the most significant films of all time. My opinion of it has softened over the years but I still think it is a fascinating film and that the message it has to offer resonates to this day. 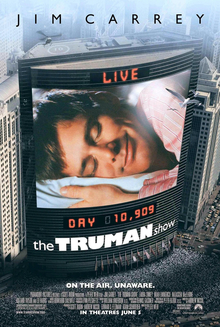 The Truman Show is considered science fiction since the premise is kind of impossible. It is the story of Truman Burbank. He was adopted by a corporation as a baby and placed in a manufactured world inside a huge studio. Now, every moment of his life is captured on camera and broadcast on a television network for everyone to watch. Of course, he doesn’t know that he’s being watched. In the 90s a TV show called The Real World came out on MTV. It followed the lives of seven people who lived together for a year and allowed us to watch their interactions and everyday lives. It was all manufactured for television, of course. But at the time, we were riveted. It spawned many more shows and launched “reality” TV. That’s still a thing, 20 years later. We still watch Big Brother and Survivor and The Bachelor. But, back then, a few people felt like they needed to say something about it. Ultimately, what is said is that what we see on the screen isn’t real. It can’t be. Truman is the only one that doesn’t know that he’s on TV. And, while he has the perfect life…a loving wife, a good job, a nice car…none of it is real. And, once he figures that out he wants nothing more than to see what’s really out there. When I was a kid I used to imagine that I was being watched on some TV show somewhere…that my entire life was just a movie. This film plays with that idea and it’s not all it’s cracked up to be. The actors go to great lengths to make sure he doesn’t leave. They even give him a fear of the ocean from his childhood so that he won’t try to leave. I also like the character that Ed Harris plays. He’s the creator of the show named Christof. This is an obvious allusion that he is Truman’s god…he is “Christ of” Truman. I can’t say a whole lot more than that without spoiling and this is definitely a movie that I want you to watch if you haven’t already. After all, it is my favorite film of 1998.